When you stay at Cori House Bed & Breakfast in Hunstanton, you'll be near the beach, within a 10-minute walk of Hunstanton Beach and Princess Theatre. This bed & breakfast is 9.7 mi (15.5 km) from Sandringham House and 0.2 mi (0.4 km) from Hunstanton Heritage Centre. If you are looking for a rewarding break in this charming part of England, The Golden Lion is the perfect choice. The Golden Lion is a small hotel but a true icon of the town. It is the oldest building in what was originally called “New Hunstanton,” as settlements in Hunstanton actually date back to prehistoric times. Built in 1846, it occupies an unrivalled position and from the hotel you can enjoy panoramic views over the pleasant green and sandy beach to the sea beyond. The Golden Lion features a popular public bar, but if you're looking for peace and quiet as you relax with a drink, the residents' bar offers a cosy and welcoming option. In summer you can sit out in our lovely gardens overlooking the seafront, as you sip a glass of wine or a pint of local ale. At The Shellbrooke, enjoy a satisfying meal at the restaurant. A complimentary English breakfast is included. Grab a bite at Le Strange, one of the hotel's 2 restaurants, or stay in and take advantage of the room service (during limited hours). Wrap up your day with a drink at the bar/lounge. Breakfast is available for a fee. Make yourself at home in one of the 9 guestrooms. Private bathrooms with shower/tub combinations feature complimentary toiletries and hair dryers. Conveniences include desks and coffee/tea makers, and you can also request irons/ironing boards. Set around a manor house dating back to 1648, these old farm outbuildings have free parking and free WiFi in all areas. 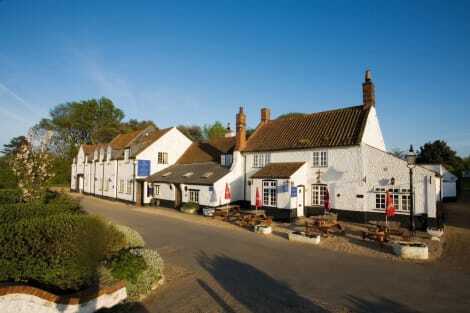 Caley Hall Hotel is situated in the village of Old Hunstanton on the coast of Norfolk. Guests can dine in the restaurant, converted from the old stables. The menu features a variety of dishes, chef’s specialities, and fresh fish. A buffet breakfast is available each morning. Each room at Caley Hall is spacious, with a carpeted floor and traditional furnishing. Each also has a TV and facilities for making tea and coffee. Caley Hall Hotel is a 10 minute walk from the wide beaches of Old Hunstanton on the very tip of the north-west coast of Norfolk. King’s Lynn, with its museums and theatres, is a 30-minute drive away. At Wash and Tope, enjoy a satisfying meal at the restaurant. Quench your thirst with your favorite drink at the bar/lounge. A complimentary English breakfast is included. Hunstanton, or ‘Hunston' as it is known locally, is a lovely little seaside town in north-west Norfolk, in the east of England. The town has plenty of vintage seaside charm, and a Hunstanton hotel is an excellent base from which to explore the endless beauty of the Norfolk coastline. Due to its location as an east coast town that faces west, Hunstanton is one of the few places in England where the sun sets over the sea. But let's not get too far ahead of ourselves – before the sun sets enjoy a day of its rays on the famous Hunstanton Beach. From the waves you can gaze up at the kids making sandcastles, with the town's stunning and unique striped cliffs in the background. For those who prefer a bit of privacy on the beach, or just want somewhere to set up the barbeque, Hunstanton's charming little beach chalets are available to rent at £18 a day. If you're up for a bit of a change of scene, within walking distance is a wealth of other gorgeous beaches. Of these, Brancaster and Heacham are brimming with great things to do on a day out. Because of its location opposite The Wash and in an Area of Outstanding Natural Beauty, Hunstanton is a mecca for wildlife enthusiasts. The Wash is home to some of the biggest seal colonies in the UK and Searles Sea Tours offer you the opportunity to see these magnificent animals up close. Those with young children may not be so keen on spending hours out on the water. Luckily, on the promenade is Hunstanton Sea Life Sanctuary, whose residents include seals, penguins, as well as less cuddly stingrays and sharks. Every day there are penguin feeding displays that will not fail to put a smile on all of the family's faces. Another jewel in the town's heavily encrusted crown is the Princess Theatre. Right in the heart of Hunstanton, this independent venue offers an extensive programme of music, theatre and comedy, and is a great place to spend a Saturday evening. As with many seaside resorts, Hunstanton has a wealth of bars and restaurants to choose from. However, there is nothing average about some of these establishments, with many offering up some of the best food and drink in the region. Before you start your day in earnest, pop into The Copper Kettle for a fry-up you will not forget quickly. Also worth a try are one of this lovely little café's homemade soups. After an evening of laughter at the theatre, you'll probably want something a bit more substantial on your plate. The Steak & Stilton is a quality steakhouse in the middle of town with a great atmosphere and stellar service. If you're after a less formal dining experience, The White Horse, in neighbouring Holme-next-the-sea, has a first-class menu of quality pub grub, including some extra special seafood. And, of course, it's the perfect place for a refreshing pint.